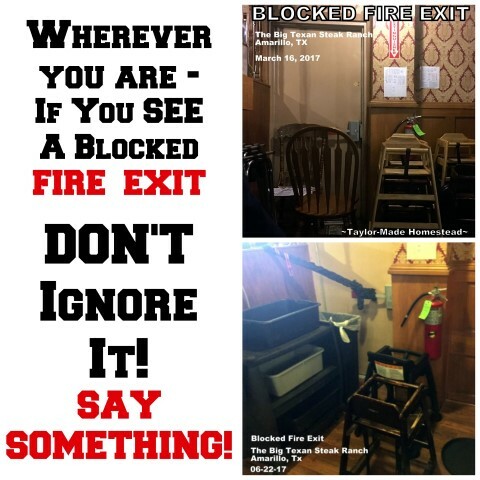 Public Safety: Restaurants Repeatedly Blocking Fire Exit?? 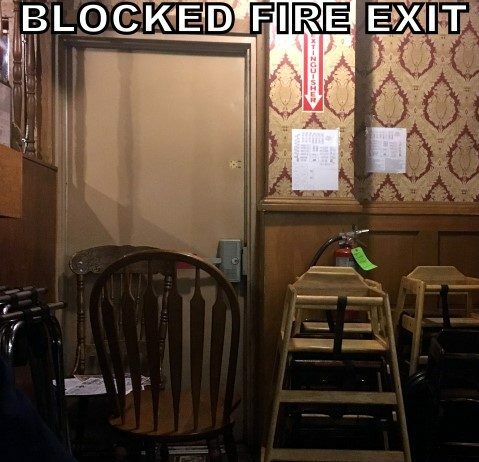 Public Safety: Restaurant Repeatedly Blocking Fire Exits?? But as we were sitting at the table enjoying our meal I looked around the room. The dining room is semi-dimly lighted and tables are placed end-to-end in long rows. But right there by our table was the fire exit. I was shocked to see it was blocked by all manner of table-bussing trash and castaways. There were chunky high chairs stacked so high in front of the fire extinguisher you’d have to don your Superman cape, fly over and somehow move them all just to get to it. And the door itself was blocked with chairs, folding trays & menu trash. Wow. With the layout of this large dining room, this could be a disaster waiting to happen! So I took the above photo and immediately contacted the local Fire Marshal via email. I gave him the specifics such as the date & time we were visiting the restaurant. I told him of the assumed blatant fire code violation we’d witnessed and attached my photo. A personal visit from the Fire Marshal’s office to the restaurant was requested. Wow, was I ever glad I had taken that photo! By the time the Fire Marshal got around to visiting them, the mess was of course all cleaned up! I’m guessing the dining room is cleaned to ship-shape every night at closing. But the clutter probably accumulates as the dining-room day goes on. I know the servers aren’t trying to do anything malicious, they’re just rushing around trying to move things out of their way during the dining rush hours. But the managers really need to make sure all employees realize the importance of this life-&-death safety issue! I’m all too aware of what happens in a fire panic situation. And I’m sadly all too aware of what happens when panicked people reach a blocked fire exit too. This issue is important and could be deadly! Then in June we once again were traveling west to visit my aunt. RancherMan wanted to stop in & fill his growler with one of their delicious specialty beers to share with my uncle over the weekend. While they were getting the growler filled, I slipped away. I went into the dining area expecting to be so proud of restaurant management & employees. I fully expected to see a cleared fire exit. That important lessons had been learned and employees had been educated. But I was shocked to see that it was not cleared at all. Once again it was completely blocked! Since we weren’t dining on this occasion, I snapped a quick photo and hurriedly left the dining area so I wouldn’t be in the way of diners & servers. At the front I asked to speak with a restaurant manger and a woman quickly came to speak with me. I told her that we had been in their restaurant back in March and had witnessed the fire exit being completely blocked. I’d taken a photo and forwarded it to the Fire Marshal. He had visited the restaurant and spoken with a restaurant manager who stated the fire exit would from then on always remain clear. Nevertheless, the exit was indeed blocked and I requested it to be cleared immediately. She instructed a nearby employee to clear the debris. I thanked her for her assistance and left. 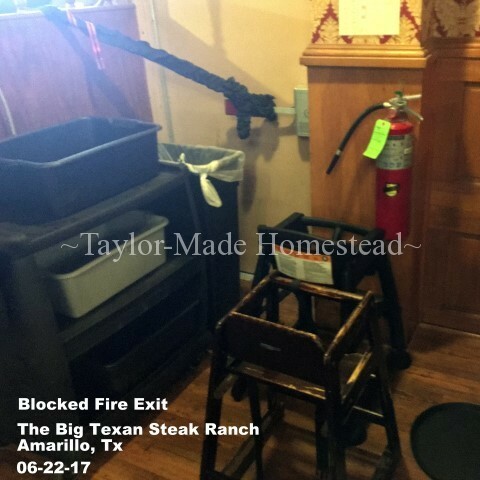 I figured the Fire Marshal would want to know that the restaurant was not fulfilling their promise to keep the emergency exits unobstructed. But as I was downloading the photo I gasped. Now I’m not 100% sure I’m seeing what I *think* I see, especially with the glare from the adjoining area window. But is the emergency exit lever actually TIED CLOSED?? It looks to me like there is something knotted to the emergency door lever and the other end knotted to a spindle at the adjoining wall? Oh no, surely that just can’t be! I immediately sent this latest photo to the same Fire Marshal with specifics of date and time. Of course I asked him to note what appeared to be an emergency door tied shut. I sent that email off and once again waited eagerly for a response. We are working on getting this violation resolved. Due to the legal bindings of this matter, I cannot provide you with any additional information at this time. However, I would like to reassure you that the […] Fire Marshal’s Office takes these violations seriously and will resolve the matter so that our community is safe. We have worked with the management team at the Big Texan to resolve this issue. I have personally inspected the site this afternoon and can confirm that they are not in violation at this time. We will continue to monitor this matter. WHAT??!! Of course the obstructions had once again been cleared by the time the Fire Marshal visited them. Again, I don’t want to be a nuisance. And I’m not just trying to get people in trouble. The fire Marshal has been very helpful and followed up with personal visits to the restaurant. He has personally spoken to managers & showed them pictorial evidence of their infractions. Managers Should Train Servers On Fire Safety! Now I love this fun restaurant and their delicious food. But fire protection is incredibly important to me! I truly hope that the managers will take note now and make absolutely sure their servers are aware of the safety hazards of a blocked emergency exit. So here’s my challenge to all of you: No matter where you are, if you see something – SAY SOMETHING! Don’t be afraid to request that the server move that stack of highchairs that are blocking the the fire exit. Don’t be too embarrassed to tell the restaurant manager that the table they just set up for the party of 12 was moved right in front of the emergency exit door. Someone’s life could depend on it. And it could be YOURS! C’mon by & sit a spell! Come hang out at our Facebook Page. It’s like sitting in a front porch rocker with a glass of cold iced tea. There are lots of good folks sharing! And you can also follow along on Pinterest, Twitter or GooglePlus. This entry was posted in Blog Posts and tagged Rants on August 11, 2017 by Texas Homesteader. This is infuriating! You are absolutely correct to push this matter. This situation is criminal. It doesn’t sound like the local fire marshal is taking this seriously. Have you considered contacting the state fire marshal? Have you considered contacting a local television station? I know you would like to avoid a big stink and are only trying to prevent a tragedy, but the matter isn’t being taken seriously by those in a position to do something about it. In fact, rather than thanking you, the restaurant manager got defensive and tried to deflect blame. Really??? It’s not a matter of placing blame, but it is the responsibility of the manager and ownership to ensure patron safety to the best of their abilities and comply with the law. I’m shocked that the restaurant and its employees can read a sign that says “Emergency Exit” or “Fire Exit” and then block it or even lock it. I don’t understand why it isn’t clicking with them that those exits are there to KEEP PEOPLE SUCH AS THEMSELVES FROM BURNING TO DEATH. Keep us posted. If the authorities do not respond to you this time, let us readers know if you believe it would be helpful for us to take some action to get this rectified. Thanks for watching out for the rest of us! Good for you for reporting this and not letting it go until it’s resolved! I’d hate to see a huge tragedy in the news someday. It sure does look like they tied the door shut on that picture. I wonder if the fire marshall calls ahead to schedule the visit and, if so, does the restaurant “clean up” any violations before he/she arrives. Does the fire marshall know the owner of the restaurant and lets things slide (which I hope is not true as peoples lives are at stake). Is the fire marshall older and just trying to put his/her time in it happens. Our drain commissioner was like that til he finally got voted out after too many years of thinking he was invincible. I know my comments sound negative but this kind of stuff does happen. It will be interesting to see if you find the same violations next time you are in the area. Unbelievable! I’ve been there, that place gets so packed you can’t even turn around. That’s a nightmare waiting to happen. WOW, that does look like they tired the door shut. That is worse than the chairs and highchairs being in the way. How would you ever move that in a hurry and if the lights go out you could not see that dark strap. I used to work in a big box store and we had OSHA come in and inspect there and also the fire marshall would inspect. One time when OSHA was inspecting, a customer has left a cart in front of the fire exit when they used the nearby restroom. We got fined for that. We were very upset about being fined for something a customer had done and management said to keep watch for carts left by customers and moved them from in front of doors. I don’t know how OSHA decides which businesses to visit. The restaurant might be too small, but you might send them a copy of you information. If your family lives close enough they could go in and see if this has been corrected then you could feel easier about it.